The 60-inch GA6400 entry is the largest model in the series. It is nice to see LG offering a variety of sizes when it comes to their new line up of Google TVs. These TVs offer a host of apps for content viewing, games, and news providers. LG uses a dual core processor to power all of the functionality so slow operation should be much less of a concern. Operating in conjunction with the dual core processor is the TruPicture XD Engine that allows for accurate color display, deep contrast, and a clear picture overall. Picture quality on the 60GA6400 is very strong for a mid tier LED TV. The bright LED backlights push a lot of light through the panel to create bright and clear pictures. Excellent light flow-through is one of the highlights of this TV. Peak whites are very bright as well. Colors are another strong point as they are presented in a very natural way after dialing in a good calibration. Color rendition isn't over saturated as we have seen on a lot of current generation LED TVs. Black levels and dark shadow detail are where the GA6400 does fall short. Blacks don't measure up to the levels of a decent plasma or an upper tier level TV and dark shadow detail leaves a bit to be desired. This TV produces an excellent overall picture when viewed from front and center. Most LED TVs suffer in this arena and the LG 60GA6400 is no different. It is not a major offender in its defense. We have seen far worse. Color and contrast begin to degrade at about the 25 degrees of center mark. This applies to horizontal and vertical viewing angles alike. Take note of this in case this TV is going to be wall mounted or placed in a room where front and center viewing is hard to achieve. Smart TV made a lot of progress in 2012. From what we have seen, we thought LG has been a pretty solid contender. Mix a well established platform with power of Google TV to the 60GA6400 and the possibilities are endless. An updated Home Dashboard includes apps like HBO GO, Youtube, and many other choices to bring you the best content at any moment. LG also included a very cool feature that will make the day of any gamer. OnLive, a streaming gaming service, is installed out of the box granting access to a large library of games. The days of the dedicated gaming console just might be numbered. It's a great app and it's nice to see LG incorporating it into their TVs. 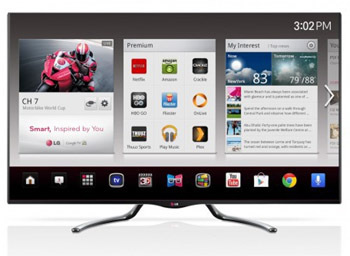 See the following page for a full review of LG's Smart TV Platform. The LG60GA6400 lacks the Cinema Screen design that is associated with a lot of high end LG TVs. The most noticeable difference is the bezel. It is a little wider so you don't get the floating image illusion. The 2 armed dark chrome stand is a refreshing change from the typical U-shaped stand found on LG's TVs. The 60GA6400 doesn't compete quite as well as the 55 inch size when it comes to value. It's competitively priced at just above $1,600, where the 55 inch size is priced under the competition. The Samsung UN60F6400 is priced just the same while the Sony KDL-60R550A is priced at a few hundred less. The 60GA6400 has a much more fleshed out smart TV platform and the QWERTY Magic Remote to keep it interesting. TV without stand (WxHxD): 54.84" x 32.36" x 1.63"
TV with stand: 54.84" x 34.96" x 13.50"